Prior to attending the IAM class this week, I spent two days teaching security analysts from the Pentagon with instructors from Special Ops Security. (The class was four days, but I was only present for the first two.) I think we offered some unique perspectives on security. Steve Andres, author of Security Sage's Guide to Hardening the Network Infrastructure spoke about hardening network infrastructure on day one. I taught network security monitoring on day two, with hands-on labs. Erik Birkholz, author of Special Ops: Host and Network Security for Microsoft, Unix, and Oracle taught methods to attack Windows systems on day three. Concluding with day four, SQL Server Security author Chip Andrews taught Web application security. 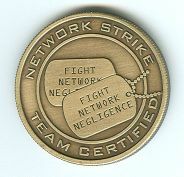 My coin is pictured here. Through a total act of good karma, Steve gave me coin 41. He didn't know that 41 was my favorite number (aside from the "94" that my USAFA training burned into my brain). I use 41 on my hockey jerseys since it was the number I was given on my high school cross-country team. Thanks Steve, and Special Ops Security! We'll most likely teach this multi-discplinary course again. Contact me via richard at taosecurity dot com if you're interested.